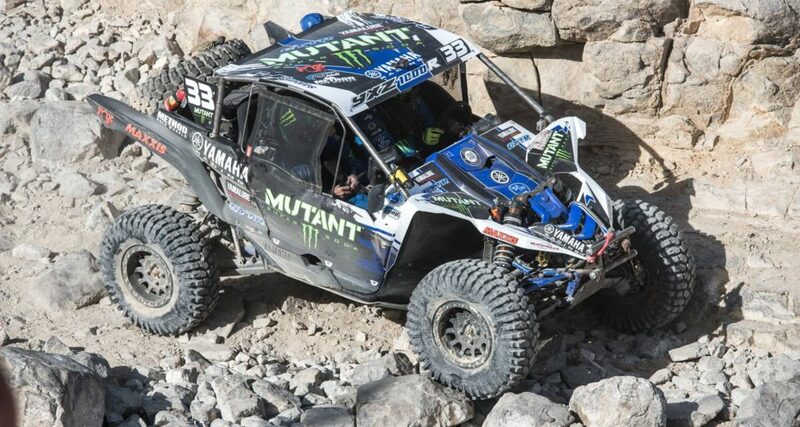 The Duo Takes on King of the Hammers: the Toughest Off-Road Race in the World. The Duo of Johnny and CJ Greaves kicked-off their 2018 racing program with one of the biggest challenges of their careers. They took a break from short-course racing to participate in the King of the Hammers (KOH) race in Johnson Valley, California. KOH is the undisputed toughest, gnarliest single day racing event on the planet, and the largest in North America, with nearly 60,000 in attendance. This 202-mile race combines the open trails and high speeds of desert racing with brutal rock sections consisting of huge rocks and boulders the size of Volkswagens, and near vertical canyon walls. 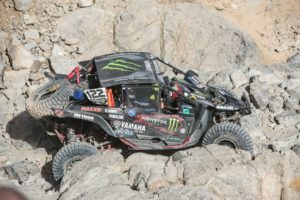 The Greaves team took-on KOH in the UTV class for the first time and discovered real quick that it would be the most demanding and challenging race they had ever participated in. In fact, out of the 118 UTV entries, only 12 finished the 7 ½ hour race. In typical Greaves fashion, the Greaves boys qualified their Monster Energy/ Monster Mutant Soda/ Yamaha yxz1000r machines 1 and 2 and started on the pole. When the dust settled, CJ and his copilot Devin Haws claimed a 5th place finish while Johnny and copilot Rodney VanEperen crossed the line in 6th. When the decision was made to compete at the 2018 King of Hammers (KOH) in the UTV division the task was quite large. As soon as the TORC Short Course series was complete in October 2017, the team couldn’t wait to take on the challenge of building two Monster Yamaha YXZ1000r UTV rockcrawling/desert machines. Being newbies in this sport made for a lot of research, but they did their homework and built what they thought were going to be two very competitive vehicles. Once the Yamahas were finished, the team headed west for 3 days of testing in an environment that they had never experienced before. The KOH compound consisted of desert and rock sections that made them begin to second-guess if what they built was even going to be capable of tackling the course. To their surprise the Yamaha YXZ1000r not only tackled everything but left them feeling that they were right on track. Their test did teach them a few things that they thought would help survive the course so they headed back to make some minor necessary changes. Two weeks later they arrived back at KOH to compete in their first every rockcrawling/desert event. Saturday, February 3rd marked qualifying day for the UTVs. The qualifying course consisted of some short course style racing as well as some rockcrawling. Johnny and CJ qualified 1-2 respectively, and granted them the pole spot for the start of the race. Race day was Wednesday, February 7th, the DUO team started side-by-side, and led 1-2 for the first 70 miles. However, the lack of experience in the rock terrain eventually caught up to them and created mishaps for both CJ and Johnny—rolling once and flat tires throughout the race. At one point, both teammates were stuck and they worked hard together as a team with their copilots to free each other. The grueling race took them 7-1/2 hours to complete, but they did not give up. CJ crossed the line in an astounding third place, but was later penalized knocking him down to 5th place. The inexperience in the KOH course caused him to miss a turn and he got lost for a short period of time missing a checkpoint, which resulted in a 15-minute penalty. Johnny crossed the line in 7th, but after the official results came in, moved up to 6th. Both drivers were very humbled as they said this was the hardest event they have ever raced in! 118 UTVs started this race with only 12 finishers that shows you the magnitude of this accomplishment. Every participant gets grand respect for being out there! The Greaves Duo is looking forward to going back in 2019, they love the challenge and with much more experience they are hoping to reach the podium! Thank you to all the sponsors that helped us support our effort in attending The KOH event! Monster Energy, Monster Mutant Soda, Yamaha Racing, Yamalube, GYTR, Maxxis Tires, Method Wheels, Fox Shoxs, Factory UTV, PRP, Beyond Redline, Victory Sign, Rugged Radios, and BluCru. ← CJ Greaves Takes 2017 Pro4 and Pro Stock UTV Championships!